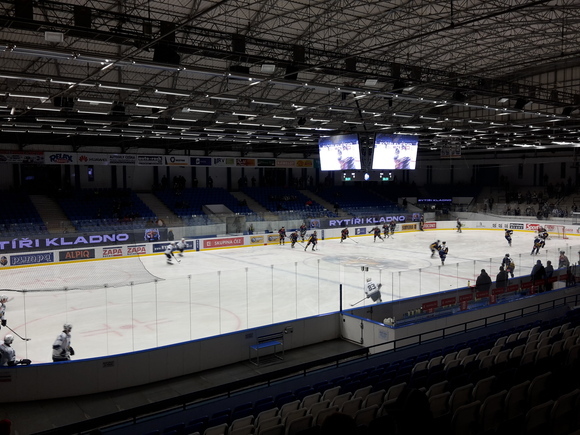 KLADNO, Czech Republic–– A comprehensive HARMAN Professional Solutions sound system has been installed in ČEZ Stadium Kladno, one of the oldest ice hockey stadiums of its kind in the Czech Republic. Originally opened in 1949 as an open air stadium, the ČEZ added a roof in 1959 and underwent an extensive reconstruction project in 2014. With an overall capacity of 5,200, the stadium’s two ice rinks have hosted many great Czech hockey players, world champions and Czech Olympic winners who trained at the stadium. Today, the stadium is home to local hockey club Rytíři Kladno and many aspiring figure skaters. Struggling for many years with an outdated, unsatisfactory audio system, stadium management recently turned to local HARMAN Professional Solutions distributor AudioMaster CZ to orchestrate a comprehensive modernization. According to Project Manager Matej Sborovy, the goal of the upgrade was to put in a sound system that can be used for all of the stadium’s audio needs, including hockey matches, figure skating and training. Special attention was given to address the stadium’s size and shape, the low-but-wide seating platforms and the increased humidity inside the stadium. The AKG by HARMAN P170 is a versatile, small-diaphragm condenser microphone that’s perfect for recording room ambience, percussion overheads, acoustic instruments and ensembles. Its lightweight 1/2-inch true condenser transducer diaphragm delivers outstanding clarity and transient response. “The whole installation was possible to finish in a relatively short time of only five days. We managed to achieve amazing speech intelligibility and very high output strong enough to handle even the loudest hockey fans with ease along with perfect sound coverage,” said Sborovy.